Paroxysmal Junctional Reciprocating Tachycardia (PJRT) is an incessant supraventricular tachyarrhythmia which can potentially cause tachycardia induced cardiomyopathy if not controlled. Flecainide is a well tolerated and effective first line treatment for PJRT in the newborn without structural heart disease. Flecainide toxicity is very rare in neonates and there is no specific antidote available till to date. Sodium bicarbonate is considered as the treatment of choice by overcoming the sodium blockade and reversing QRS prolongation. We report a case of flecainide toxicity in a preterm neonate with PJRT which was successfully managed by reversing the sodium blockade. A 27 weeks, 2 days gestation second gravida mother was referred to our fetal cardiology unit in view of fetal tachycardia diagnosed in an outside scan. Fetal echocardiogram was done showed supraventricular tachycardia (SVT) with a fetal heart rate (HR) of 228 beats/min (bpm) with 1:1 atrioventricular (AV) conduction and no fetal hydrops [Figure 1]. There was no structural heart defect in the fetus. The fetal tachycardia was controlled using a combination transplacental therapy with flecainide (100 mg Q 8 hourly, tapered to 50 mg Q 12 hourly) and digoxin (initial intravenous [IV] digitalization followed by oral maintenance of 0.25 mg Q 12 hourly). 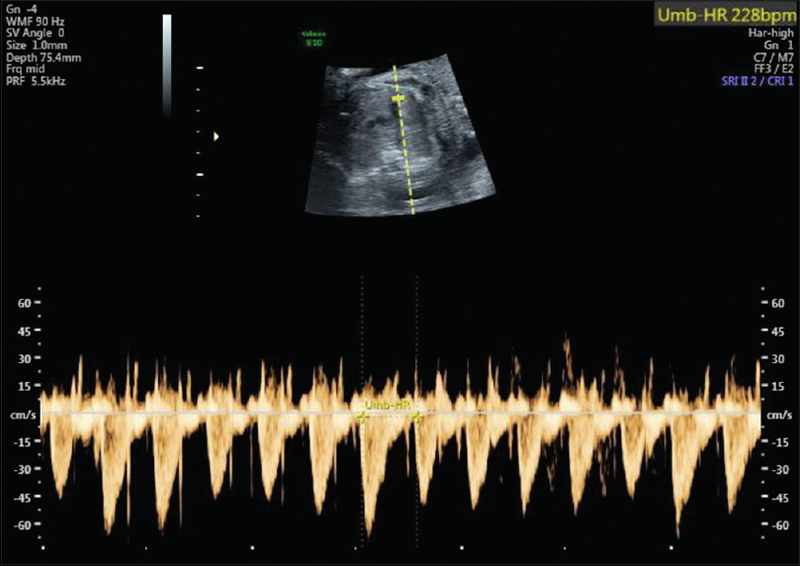 At 36 weeks of gestational age, fetal echocardiogram showed a recurrence of SVT (HR 220 beats/min) with no hydrops. In view of recurrence, the neonate was delivered prematurely at 36 weeks by cesarean section with a birth weight of 2 kg. Neonate cried immediately after birth with good Apgar and was hemodynamically stable. 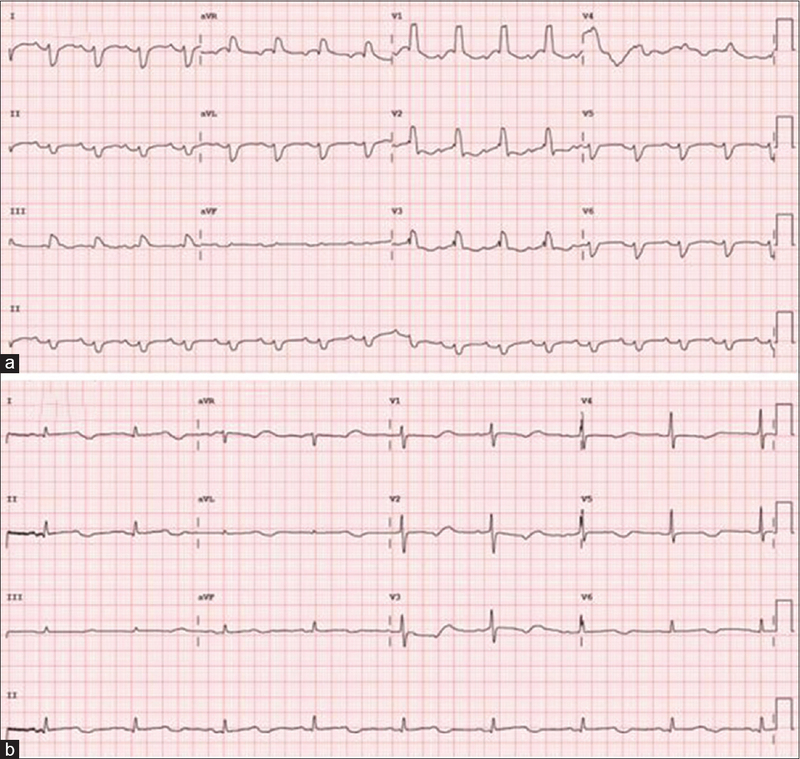 Postnatal electrocardiogram (ECG) was done showed narrow QRS tachycardia with HR of 214 with a long refractory period interval and 1:1 AV conduction.P waves were inverted in leads II, III, and aVF [Figure 2]a. With administration of adenosine 200 mcg/kg IV rapid push, the tachycardia terminated with a P-wave transiently and recurred with a sinus beat without prolongation of PR interval [Figure 2]b. Hence, a diagnosis of permanent junctional reciprocating tachycardia was made. The neonate was started on IV metoprolol bolus, but the tachycardia persisted despite three doses. Hence, oral flecainide was started at 3 mg/kg Q 12 hourly dosage; this restored sinus rhythm immediately. Echocardiogram showed a structurally normal heart. The neonate was hemodynamically stable and was initiated on oral feeding. On day 3 of life, the neonate suddenly developed a severe cardiovascular compromise with no prior rhythm variations. ECG showed broad QRS bradycardia with a HR of 44–50 bpm. Neonatal advanced life support was initiated, and he was mechanically ventilated. Neonate was resuscitated with IV adrenaline (0.01 mg/kg), atropine (0.02 mg/kg), and isoprenaline infusion (0.05 mcg/kg/min). In view of severe left ventricular (LV) dysfunction on echo, dobutamine (10 mcg/kg/min) and calcium (4 ml/kg/day) infusion were started. On evaluating possible causes for the sudden deterioration, we found out that the neonate had received an inadvertently high dose of flecainide (60 mg instead of the prescribed 6 mg) due to a dilutional error on the part of the bedside nurse. Having confirmed flecainide overdosage, we initiated the specific protocol for overcoming sodium blockade, including sodium bicarbonate (3 doses at 3 ml/kg of 7.5% NaHCO3) and 50% magnesium sulfate (0.1 ml/kg) intravenously. ECG done showed wide QRS duration during faster HR [Figure 3]a and narrow QRS duration during slower rates [Figure 3]b, a property known as use-dependent kinetics, a well-known feature of flecainide overdose. We also ensured adequate hydration to ensure renal clearance of the drug. We continued supportive care ensuring higher sodium levels in the blood with constant monitoring. Within 36 h, the neonate reverted to sinus rhythm, hemodynamics improved, LV function recovered, and the neonate was extubated after 72 h. Rhythm control was maintained using beta-blockers and amiodarone, on which the baby was discharged from the hospital. 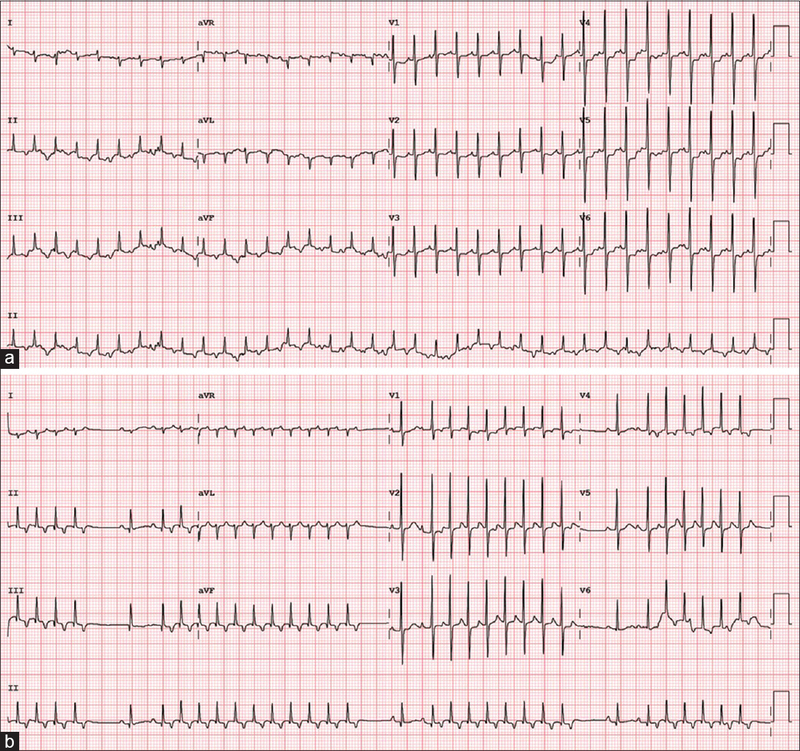 On follow-up after 3 months, the neonate was clinically well and in sinus rhythm [Figure 4]. Amiodarone was discontinued after 3-month follow-up while beta-blockers were continued. Flecainide is a Class IC lipid soluble antiarrhythmic drug and is well tolerated and effective as the first-line treatment for paroxysmal SVT in newborn without structural heart disease. It has three major electrophysiological effects – inhibitor of the fast sodium channel (and slow calcium channels at higher doses), prolongs action potential duration, and inhibitor of rapid repolarizing current. Most of the antiarrhythmic drugs increase action potential during slow HRs and attenuate it during high HRs, a property known as reverse use dependence. However, flecainide binds to target channels more effectively when the channel is stimulated at a fast rate, a property known as use-dependent kinetics. It occurs due to sodium channel blockade which results in reduced sodium loading and Na+, K+ ATPase stimulation during tachycardia. Hence, flecainide is proarrhythmic and should be avoided in structural heart disease. In view of these properties, the drug should be started under strict observation. Doses should be gradually increased till steady state (five times the half-life of the drug) is achieved. The QRS duration should be monitored while increasing the drug dose. The half-life (T1/2) of flecainide is age dependent (neonates 29 h, infants 11–12 h, and children 8 h). It has a narrow therapeutic index and greater oral bioavailability (>90%) and eliminated through renal (33%) and hepatic (66%) metabolism. Oral absorption of flecainide is decreased by milk products. Flecainide toxicity is very rare in neonates. Most reported cause for toxicity in neonates was the result of dosing errors. 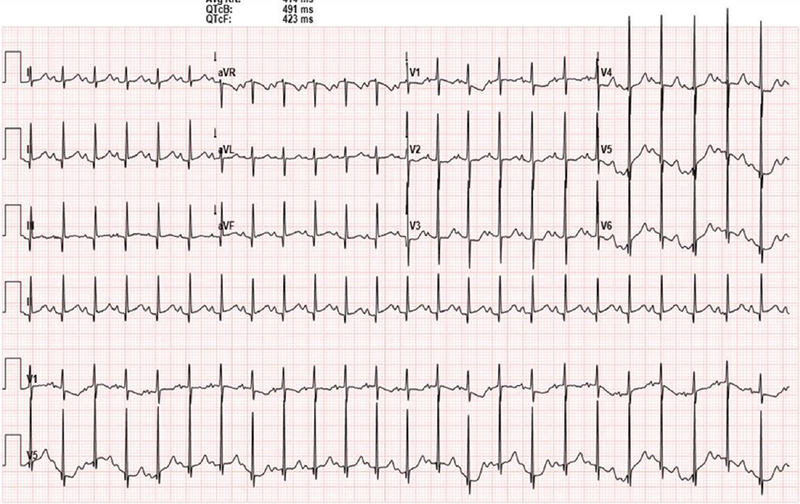 Most reports describe hemodynamic compromise or wide QRS tachycardia as manifestation of flecainide toxicity. Our patient had bradycardia with hemodynamic compromise as the presenting feature. The use-dependent kinetics of flecainide is well illustrated in our patient where there was widening of the QRS complex at faster HRs [Figure 3]. It is interesting to note that because of the QRS widening, even SVT may manifest as a wide QRS tachycardia mimicking a ventricular tachycardia in the face of flecainide toxicity. Prolongation of PR interval, QRS duration, bradyarrhythmias, depression of LV function due to negative inotropic effect, and neurological manifestation including obtundation and seizures may occur with flecainide toxicity. As serum flecainide level measurement is not readily available, a diagnosis of flecainide toxicity is usually done clinically. There is no antidote available till date; sodium bicarbonate is considered as the treatment since it is thought to overcome the sodium blockade and may reverse QRS prolongation. Sodium bicarbonate increases extracellular sodium concentration, and this displaces flecainide from its receptor sites. However, it showed mixed effects in various reports and animal studies. Alkalinization may be helpful as it reduces the active ionized form of flecainide as flecainide is a weak acid. Few case reports showed success with extracorporeal membrane oxygenation (ECMO), IV magnesium sulfate, and lipid emulsion therapy (LET)., LET removes the lipid soluble drugs (lipid sink) from serum and is lifesaving in the context of flecainide toxicity. It may also open voltage-gated sodium channels and thus improve myocardial contractility. However, it failed to demonstrate efficacy when compared to hypertonic sodium bicarbonate in animal studies. Veno-arterial ECMO appears to be a promising option in patients with cardiac arrest, cardiogenic shock, or pulseless electrical activity since it allows drug metabolism and elimination by restoring circulation. Our case was due to a dosing error and once the cause was identified, our protocol targeted toward overcoming sodium blockade with IV sodium bicarbonate infusion along with supportive therapy reversed the toxicity of flecainide. We also maintained adequate hydration to promote renal clearance of the drug. In view of high volume of distribution of flecainide, peritoneal dialysis was not considered. It is very important to ensure a strictly monitored and supervised dosage protocol when flecainide is used in neonates. Once toxicity is suspected, measures to overcome sodium blockade with IV sodium bicarbonate should be the treatment of choice to reverse this rare but potentially fatal clinical situation. Kang KT, Potts JE, Radbill AE, La Page MJ, Papagiannis J, Garnreiter JM, et al. Permanent junctional reciprocating tachycardia in children: A multicenter experience. Heart Rhythm 2014;11:1426-32. Reiffel JA, Blitzer M. The actions of ibutilide and class Ic drugs on the slow sodium channel: New insights regarding individual pharmacologic effects elucidated through combination therapies. J Cardiovasc Pharmacol Ther 2000;5:177-81. O'Hara G, Villemaire C, Talajic M, Nattel S. Effects of flecainide on the rate dependence of atrial refractoriness, atrial repolarization and atrioventricular node conduction in anesthetized dogs. J Am Coll Cardiol 1992;19:1335-42. Wang Z, Fermini B, Nattel S. Mechanism of flecainide's rate-dependent actions on action potential duration in canine atrial tissue. J Pharmacol Exp Ther 1993;267:575-81. Escudero C, Carr R, Sanatani S. Overview of antiarrhythmic drug therapy for supraventricular tachycardia in children. Prog Pediatr Cardiol 2013;35:55-63. Jang DH, Hoffman RS, Nelson LS. A case of near-fatal flecainide overdose in a neonate successfully treated with sodium bicarbonate. J Emerg Med 2013;44:781-3. Salerno DM, Murakami MM, Johnston RB, Keyler DE, Pentel PR. Reversal of flecainide-induced ventricular arrhythmia by hypertonic sodium bicarbonate in dogs. Am J Emerg Med 1995;13:285-93. Reynolds JC, Judge BS. Successful treatment of flecainide-induced cardiac arrest with extracorporeal membrane oxygenation in the ED. Am J Emerg Med 2015;33:1542.e1-2. Williamson DG, Sinha A, Frost I, Singh VK. Management of persistent wide QRS in flecainide overdose with magnesium sulphate. Emerg Med J 2010;27:487-8. Cave G, Harvey M, Quinn P, Heys D. Hypertonic sodium bicarbonate versus intravenous lipid emulsion in a rabbit model of intravenous flecainide toxicity: No difference, no sink. Clin Toxicol (Phila) 2013;51:394-7.